The real estate industry is extremely service-oriented and consumers expect the very best from the professionals that they work with throughout the process of buying or selling a home. A home inspector plays a crucial role in this process and should be chosen carefully. Here are some important qualities that every buyer or seller should look for when selecting a home inspector. When dealing with a significant investment like a house, it is in your best interest to work with an inspector that has the experience to do the job right. They should have extensive knowledge of all of the systems and components of a home and be able to identify current or potential problems with each of them. This provides a safeguard to buyers and real estate agents and allows them to negotiate a contract that accounts for any potential issues. They should have experience inspecting older homes as well as new construction, as each type of home presents its own possible problems. You should also look for ASHI (American Society of Home Inspectors) certification from your inspector, so you know your property will be inspected to a higher standard than other inspectors. This is not the time to look for the fastest service and you should be concerned if an inspector is proud of how quickly they can complete the job. 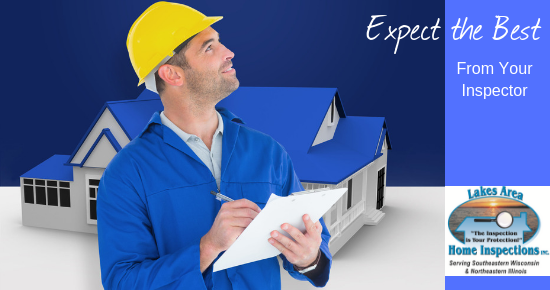 A thorough inspector, like those at Lakes Area Home Inspections, will take the time to check all of the important interior and exterior components and identify any major or minor defects, issues that could lead to future defects and any noticeable safety hazards. And finally, the information should be presented to the client in a detailed, easy-to-understand report. A really great home inspector is not only great at their job, but also goes above and beyond to provide superior service to their clients. Things like arriving on time and having the ability and patience to explain everything to a potential buyer and answer all of their questions should be a top priority. At Lakes Area Home Inspections, we always put our client first. We will take as much time as needed on each appointment to make sure that the client really understands the issues. We take great pride in the undivided attention we provide and the knowledge that our clients are truly satisfied at the end of the process and often refer their friends and family to us. Contact us today at 262-818-0911 to see why we are the best choice for your home inspection needs.